VEDANTA recently invited bureaucrats and glitterati to pat its back on corporate social responsibility activities at its first such meeting. But people living around Vedanta Aluminium Ltd's one-million-tonne alumina refinery in Lanjigarh in Orissa knew better. They said the refinery was putting their lives and livelihoods at stake; they threatened to launch an agitation. In the nearby Niyamgiri hills, the Kondh tribals planned to launch a struggle to save the bauxite-rich hills from mining by the company (see box "Tribals struggle to save Niyamgiri"). "This factory has destroyed us. Neither can we breathe properly because of the dust flying around nor can we bathe in the river Vanshdhara as the water is polluted by caustic discharge from the refinery.We will not put up with this anymore," declared Senapaty Nayak, the former sarpanch of Chatrapura village on the periphery of the factory in Orissa's Kalahandi district. The Vanshdhara flowed in a narrow stream between the refinery and the village. Apart from harming the crops, the pollution was damaging the health of the people of Chatrapura and other villages in the vicinity. So the villagers have decided to launch a struggle. "We will destroy the water pipes of the plant near our village. We will also not allow any of their vehicles to pass through this area. With our very existence in jeopardy we can go to any extent," the former sarpanch said, while others around him nodded in agreement. Narayan Harijan, another campaigner against the refinery from Chatrapura, said his father Kandha died last year after taking a bath in Vanshdhara. "He had blisters all over his body. We took him to Rayagada for treatment but doctors could not save his life," recalled Narayan. Dogla Harijan, another villager, is also said to have died last year, after taking a dip. "Dogla started vomiting as soon as he returned home. He died before we could take him to the hospital," said Nayak. In both cases, the villagers did not get the post-mortem report of the bodies. Nonetheless, they were certain the deaths were caused by the caustic material discharged into the river. The people of Chatrapura claimed to be the worst affected. "We have to be more aggressive than others as we have been hit the hardest. The caustic water from the plant is damaging our paddy crops," said Nayak. Complaints of skin diseases from bathing in the river abound in the nearby Harekrishnapur village as well. Kusum Tula said, "We used to bathe in the river but now I am scared of taking my children there. Both my sons have itches and blisters." She has seen fish and crabs die in the river. Bhoj Sahu, a mechanical helper at the plant from Harekrishnapur, agreed, "This is because of the discharge." 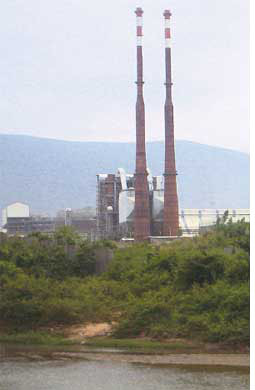 On September 9, some people from Chatrapura, Harekrishnapur, Rengopali and Gopinathpur villages in the vicinity of the plant sent a petition to the Orissa State Pollution Control Board about the discharge into the Vanshdhara and the dust emission from the plant's boilers that was threatening agriculture. The board sent scientists to conduct air and water quality tests in the area but was yet to take action. 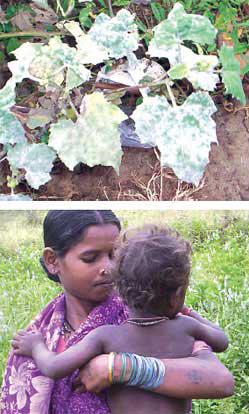 "The damage caused by the discharge is not always visible but there are times when you can clearly see the white dust settling on the plants and the paddy wilting," said Anant Pal, a young man from Chatrapura, pointing to a leaf coated in white dust. "This dust is from the coal-fired boilers of the plant." Manoranjan Mallick, the district agriculture officer of Kalahandi said he had heard about crop damage in villages close to the Vedanta plant during occasional visits to the area but never received any complaints. "The government didn't ask us to look into the matter," he said. In Bandhuguda village, the dust emission led to respiratory infections, with villagers alleging cases of tuberculosis. Baga Majhi and Laxa Majhi, both tribals, were suspected to be suffering from the disease, with prolonged bouts of coughing. While Debashish Roy, a medical officer of the Lanjigarh government hospital, rubbished the tuberculosis claim, saying it had nothing to do with pollution, he did admit that people afflicted with cough kept visiting the hospital from villages around the refinery. "There is no denying that proximity to the plant can cause problems," said Roy. L K Pradhan, Lanjigarh block development officer, also mentioned complaints against dust emission by the villagers who had asked for the plant's relocation. S K Patnaik, the company's vice-president, special projects, denied discharge of caustic water into the Vanshdhara, saying the company was running a zero-discharge plant. He also ruled out leakage from the toedrain, where seepage from the pond containing slurry after extraction of alumina got collected. 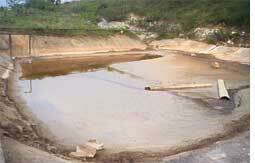 The pond is called the red mud pond and the slurry is the bauxite residue, also called red mud. Patnaik argued that the company would not allow caustic water to go waste because it was required for processing and extracting alumina from bauxite ore.
Certain findings of the Rayagada regional office of the state pollution control board, following the villagers' petition, may not be to the liking of Patnaik and his colleagues though. According to the board's scientist, Shyamghan Pradhan, who conducted tests on and off the plant premises on October 10 and 11, the pH level of discharged water in the toedrain was 10.3, way beyond the safe upper limit of 8.5. The scientists did not mention any discharge from the toedrain into the river but leakage could not be ruled out. The pH level of the plant's pond for storing storm water was found to be 8.3. "This pond normally contains non-contaminated water. A pH of 8.3 shows the presence of extraneous materials in the water," said P C Routa, regional officer of the pollution control board. The pH level of Vanshdhara at Chatrapura was found to be 7.9 which, according to Routa, was not alarming as the pH level of the river usually varied from 5.5 to 8.5. The water and ambient air tests conducted at Bandhuguda were found to be normal, but Pradhan came across deposits of dust on roofs and leaves. Sources within the board admitted that in May this year, the board had received complaints about the refinery polluting the Vanshdhara. Based on the board's findings, weak areas in the red mud pond had been identified. But no measures were taken. The villagers were still waiting for the board to take action against the company.